Gregory Bateson helped me learn to think about how human beings engage in (ultimately) self-destructive forms of competitive growth; Wendall Berry continues to inspire how I think about rural urbanization under capitalism. Bateson provided a theory of schismogenesis or “vicious circle,” in which our behavior provokes a reaction in another, whose reaction, in turn, stimulates us to intensify our response. According to Bateson, schismogenesis comes in two flavors: symmetrical and complementary. Symmetrical relationships are those in which the two parties are equals, competitors, such as in sports. Complementary relationships feature an unequal balance, such as dominance-submission (parent-child), or exhibitionism-spectatorship (performer-audience). The point, of course, is that unless there is an agreed upon limit to the development of provocation and response, the relationship just keeps going until it hits a natural limit – collapse of the relationship because neither side can continue to meet and exceed the other’s call. Berry teaches that one of the more deadly tendencies in capitalist urbanization in the United States is to turn all of us, eventually, into Native Americans. On Berry’s reading, the basic structure of American life was to eradicate the people and lifeways of Native Americans and then to replace those people and lifeways with settler capitalism. Importantly, this model of a settled community being replaced by the next, more intensive form of capitalist production both established the rhythm of American development and has become a powerful symbol of how generations of Americans have justified our destruction of people and lifeways in favor of more efficient and valuable forms of life. Importantly, efficient and valuable are defined in terms of profit. Thus, industrial, mass agriculture replace the settlers that had replaced the Native Americans; smart technologies and production are offered as the solution to problems of rustbelt withering. How have Bateson and Berry shaped my understanding of Shenzhen? Shenzhen all too clearly grows through an amazing range and diverse levels of complementary schismogenesis. 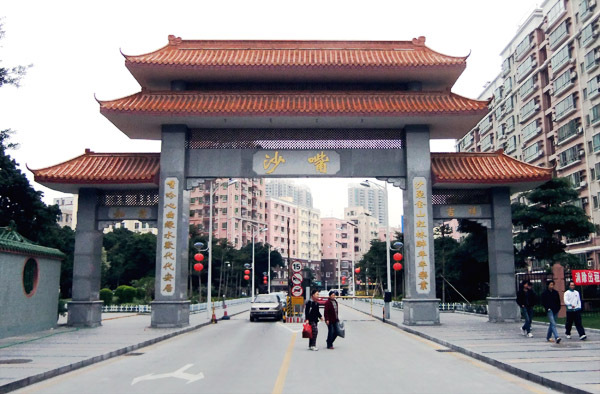 Within Shenzhen, villages, neighborhoods, districts, and municipal ministries all engage in compete for competitive advantage; at the same time, Shenzhen as a city competes with all other cities in the PRD as well as internationally. In this system, the function of urban planning is contradictory. On the one hand, the Municipal government needs to stimulate competition so that the city can respond to development in Guangdong, China, and the world. On the other hand, the Municipal government also needs to set limits – usually in the form of social goods, such as parks, schools, and hospitals – on how far development can encroach on the people’s quality of life. Moreover, as Berry noted, the pattern of the first razing and replacement sets the rhythm and symbolic lexicon for understanding capitalist schismogenesis. The problem in Shenzhen is that eventually, we all become locals, our homes and lifeways replaced by more capitalist intensive forms of consumption (increasingly high maintenance housing) and production (higher value added production). The result has been the ongoing production of rubble. Villages go. 80s housing goes. 90s residences are going. And as in the United States, postmodern nostalgia has become one of the forms that middle class resignation to this fate takes. The poor occupy the rubble until they are moved elsewhere. Images below. stunning play of light. every morning, i wake to beauty, despite. 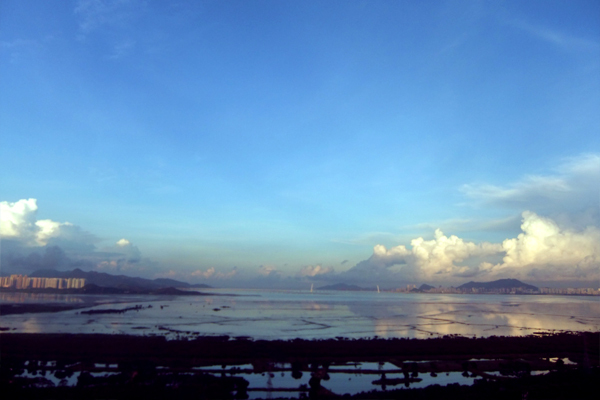 and yes, hard to believe that this is the eastern edge of the houhai land reclamation area, viewed yesterday at sunrise, mid-day, and early evening.